The decision to field Ram Nath Kovind, 72, as the party's presidential candidates last year was seen as a masterstroke by PM Modi-Amit Shah. Bengaluru: Prime Minister Narendra Modi on Tuesday responded to searing attacks that sought to project the ruling BJP as "anti-Dalit", accusing the Rahul Gandhi-led Congress of trying to divide people for electoral gains and showcasing President Ram Nath Kovind's appointment as evidence of his party's credentials via-a-vis Dalits. PM Modi said the Congress had been provoking Dalits against the BJP because it had not been able to stomach the fact that the BJP had made a Dalit the country's President. "The Congress is upset that the BJP got a majority... It is wondering why the BJP, despite getting such a huge mandate, when it could do what it wants... What is the reason that the first President that they (BJP) could appoint, they installed a Dalit as the President... 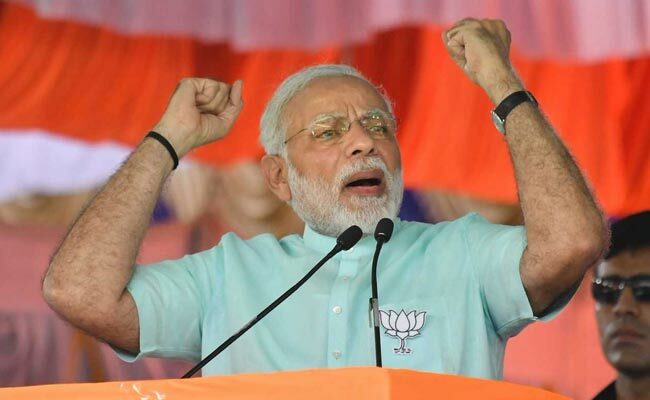 So it is misleading the Dalits, spreading falsehood," PM Modi said in his election meeting in northern Karnataka's Belagavi, countering the Congress president Rahul Gandhi's incessant attacks on the BJP and the centre. The decision to field Ram Nath Kovind, 72, as the party's presidential candidates last year was seen as a masterstroke by PM Modi-Amit Shah for a party that has been for decades seen as a party of upper castes and traders. PM Modi also urged the Congress to stop trying to divide society for the sake of power. "Just like any fish cannot survive without water, Congress cannot live without power. That is why they are spreading lies, dividing people on the grounds of caste," he said, insisting that the Congress was also "jealous" that a person from a humble background had become Prime Minister. The public meeting in Belagavi, earlier known as Belgaum, was the last of the three election rallies that PM Modi addressed in Karnataka today as part of his whirlwind tour of the state. Karnataka will vote on May 12 for a new 224-member assembly. The results will be declared three days later. In tweets and his public speeches over the last few months, the opposition led by Congress has stepped up its attack on the BJP for what it calls is its "anti-Dalit approach". Just on Monday, Congress president Rahul Gandhi had again referred to reports about police officers at a recruitment centre in Madhya Pradesh labelling aspiring police constables with their caste status on their chest. "The casteist mentality of the BJP government has stabbed the country on its chest. By writing SC/ST on the chest of the youth of Madhya Pradesh, it has attacked the Constitution," Mr Gandhi said in a tweet. Rahul Gandhi last month led his Congress party on a day's fast at Mahatma Gandhi's memorial Rajghat in Delhi in what the Congress called an attempt to "promote communal harmony" and to protest clashes during the Dalit protests on April 2. Accusing PM Modi and his government of being "anti-dalit" the Congress president said his party was against the BJP's ideology that seeks "to divide the country, crush the Dalits, tribals, minorities... We are against the ideology of the BJP".